Sometimes there’s no time to cook from scratch. But what are the best go-to timesaver ingredients? Our Test Kitchen experts announce their favorite shortcut superstars right here. Lasagne Chilaquiles: For a multicultural spin on breakfast, crumble eight Barilla Oven-Ready Lasagne noodles into 16 oz. of salsa; simmer 10 minutes. (No precooked pasta required!) Top with Wholly Guacamole Classic and fried eggs; sprinkle with cilantro. Makes eight servings. Apple Danish Bites: Craving apple Danish? Give in to the urge by pressing a tube of Pillsbury Crescents into eight greased muffin cups. Dollop the dough with Philadelphia Ready-to-Eat Cheesecake Filling; add apple slices, McCormick Apple Pie Spice and Diamond Shake and Spoon chopped pecans. Fold pastry edges to form bundles; bake at 375° for 11-13 minutes. Makes eight bundles. Yogurt with a Buzz: Kick morning into high gear by stirring 1 tsp. of Nescafé Taster’s Choice instant coffee into a bottle of Drink Chobani Vanilla Bean Yogurt. It’s a whole new day! Makes one serving. Wholly Guacamole Classic: Add a luscious finishing touch to fish tacos, salads, breakfast burritos and burgers. Here’s your ticket to a home-cooked meal, even on those crazy days that just won’t stop. Italian Sub Zucchini Boats: Sail into dinnertime with these pizza boats. Halve three zucchini lengthwise; hollow out the centers and stuff with slices of Johnsonville Three Cheese Italian Style Chicken Sausage. Top with Contadina Pizza Squeezeand strands of Galbani String Cheese. Bake, covered, in a greased 13×9-in. baking dish at 350° for 25 minutes. Uncover; bake for 15 more minutes. Makes six servings. Super Fast Zuppa Toscana: Make soup 1-2-3! In a Dutch oven, mix one package each Jimmy Dean Fully Cooked Sausage Crumbles and Simply Potatoes Diced Potatoes With Onion; simmer with 3 Tbsp. Better Than Bouillon Roasted Chicken Baseand 8 cups water. Cook until reduced slightly, stirring in 1/2 cup cream and 10 oz. fresh baby spinach or kale at the end. Makes 12 servings (3 qt.). 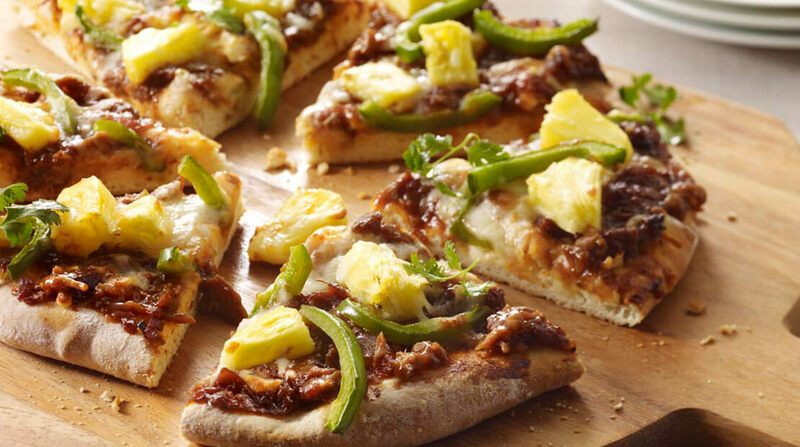 BBQ Chicken Supper Pie: Bring the barbecue indoors: In an 8-in. square baking pan, combine a 16-oz. tub of Lloyd’s Seasoned Shredded Chicken in Original BBQ Sauce with a package of Green Giant Roasted Corn. Top with Alexia Waffle Cut Sweet Potato Seasoned Fries; bake at 425° for 25 minutes. Great smoky flavor! Makes eight servings. Lloyd’s Seasoned Shredded Chicken in Original BBQ Sauce: Skip the slow cooker and add a smoky note to BBQ pizza or nachos.